We found that food onboard Oosterdam is fairly consistent, which is a good thing since the majority of our meals were tasty and well-prepared. The biggest surprise was that the most expensive dining experience resulted in one of the most lackluster dinners of our cruise. That being said, we were impressed with the value of the Italian venue and the quality of the steakhouse, as well as the level of service across all onboard restaurants. Included dining is limited to the buffet, the Dive-In poolside grill, select room service items and the dining room (which on the last sea day, wasn't open for lunch). If you are interested in sampling the specialty dining rooms, money-saving packages are available. Two nights in Pinnacle Grill is reduced by $8 per person; one night in Canaletto and one night in Pinnacle is reduced by $6 per person to $44 a head rather than $50. The Chocolate Surprise Parade takes place at least once per cruise, during which crew members present passengers with trays of indulgent cocoa concoctions in whatever bar or lounge they might be in that evening. It's a nice -- if not gluttonous -- treat. Vista Dining Room (Decks 2 and 3): Oosterdam's main dining venue is a bit nondescript -- there are paintings of fruit, giant vases of roses, a spiral staircase that leads to the second deck in the middle of the room and metallic sculptures (truthfully, rather strange) on the ceiling. But, the venue delivers where it counts, in the variety and quality of the offerings, as well as the friendly service. Having had a cup of premium brand Harney & Sons tea in a specialty restaurant, our request for that brand, not usually available in the dining room, was met with no hesitation. Breakfast is served daily in the dining room (usually on just one deck, from 8 to 9:30 a.m.), and it has a delightful array of options, organized by section: Something Simple includes cereals, fruit, parfaits, bagels and lox; Greenhouse Spa Selections includes veggie frittatas and muesli; Breakfast Classics and Three-Egg Omelets offer a nice selection of Benedicts and omelets, as well as Asian, American and English breakfast spreads; Hot Off the Griddle delivers Belgian waffles, pancakes and two types of French toast; and Hearty Skillets (our favorite) offers two different types of egg scrambles that come in a skillet-style dish. Lunch, on the other hand, is more limited. On our six-night cruise, one hour of lunch was available on the first sea day, it wasn't offered at all on port days and was booked for a private event on the last sea day. When it is available, expect a small menu of soups and sandwiches and a few hot entrees, as well as dessert. 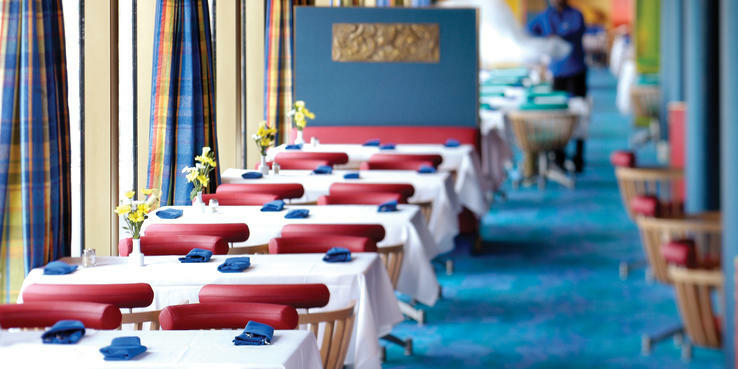 Dinner (open seating from about 5 to 9 p.m.) is where the Holland America partnership with executive chef Rudi Sodamin and the Culinary Council (made up of five other renowned chefs) shines. Dishes are created to reflect the destination -- such as callaloo soup in the Caribbean -- as well as the specialties of each chef. Menus are divided into starters, soups and salads, entrees and desserts. Signature dishes of salmon, steak and chicken are available every night. Adventurous diners will be rewarded with creative plates, such as a black sesame jumbo shrimp salad topped with poached eggs, cherry tomatoes, radishes, brioche croutons, cheese foam and citrus-ponzu dressing. But, those with more limited palates shouldn't fret -- simpler options, such as a turkey dinner, are offered with equal gusto. The dessert menu highlights classics, and the baked Alaska is back, along with other favorites such as devil's food cake and fruit crisps. Recommended wines are listed on the first page of the menu each evening. Tea is offered on sea days around 3 p.m. Boxes of Bigelow tea are passed, along with your standard selections of finger sandwiches, pastries and scones. Lido Market (Deck 9): Oosterdam's buffet option is the wide-open Lido Market, located on the Lido Deck. The selection here offers something for everyone, with a string of stations that repeat in order to help with crowd control. This casual dining option is open morning, noon and night. Breakfast (served from 6:30 to 10 a.m.) features made-to-order omelets, bacon, hash browns, fresh fruit, yogurt, cheese, cereal and more. A limited number of stations are open for snacks from 2 to 5 p.m. and 10:30 to 11:30 p.m. Drinks are self-serve, but crew members will also come by to take a drink order. The 24-hour beverage stations offer water, juice, lemonade, iced tea, coffee and hot tea. Lunch (served from 11:30 a.m. to 2 p.m.) consists of pizza, sandwiches, salads, soups, sides, a carving station, an Italian station (featuring create-your-own pasta dishes) and an Asian station (with offerings that include sushi and pad thai). There are also ice cream and dessert stations, featuring tarts, pies, cakes, puddings and more. Dinner (served from 5:30 to 8 p.m.) might feature a classic appetizer (such as shrimp cocktail), salad and soup, and an entree (such as prime rib with Yorkshire pudding). The seating area in the Lido Market is modern and attractive, with plenty of tables near windows featuring tan-and-black chairs or cozy booths and dark wooden tables with orchids atop each. Some outdoor seating is scattered around the Sea View pool, at the very back of the ship. Dive-In (Deck 9): Dive-In at the Terrace Grill is Oosterdam's poolside spot for burgers, dogs and fries. Three types of Nathan's hot dogs are served, along with five tempting burgers and yummy fries that can be ordered smothered in cheese sauce or topped with the house specialty Dive-In sauce. Orders are placed at the window, and buzzers are handed out so patrons know when their meal is ready. Nearby, there's a self-serve drink station and a Mexican-themed food station serving fajitas, tacos, salsas, black beans and rice. Dive-In is open most days from 11:30 a.m. to 5:30 p.m.
Explorations Cafe (Deck 10); a la carte: The drinks here will cost you, but all of the food is served free of charge. Expect light sandwiches and sweets like chewy cookies, biscotti and brownies. They make for perfect nibbles while solving a puzzle or reading a magazine in the Crow's Nest. Room Service: A menu of complimentary, 24-hour room service items is available to all Oosterdam passengers. The breakfast, served from 6 to 11 a.m., includes continental options, coffee and juice, plus a choice of two omelets. The all-day menu, which is served from 11 a.m. to 11 p.m., includes a Caesar salad, a roast beef sandwich, quesadillas, roasted chicken, a fruit-and-cheese platter and cheesecake. Coffee, tea, milk, water and iced tea are included, but other beverages are additional. Pinnacle Grill (Deck 2); $35 per person (dinner); $10 per person (lunch): While the cover isn't as cheap as in Canaletto (another onboard specialty restaurant), Pinnacle Grill offers a tremendous value with a menu that includes crabcakes, seafood and premium cuts of beef for the price of an entree in a land-based steakhouse. The space is dark and elegantly appointed and tables feel intimate, which makes for a great date night. We particularly enjoyed the blown-glass jellyfish light fixtures on the ceiling. One of our favorite dining experiences onboard was in Pinnacle Grill: Sure, the restaurant offers what you would expect (filet mignon, grilled lamb chops and Alaskan salmon), but it also serves up more creative dishes, including spicy lemongrass chicken in tomato broth (to die for) and a roasted pumpkin risotto with Swiss chard and mascarpone cheese (an ideal choice for those who prefer to dine meatless). Service is well paced and we liked the variety of sharable sides on offer -- including the whipped potatoes and the sauteed Brussels with Parmesan and pancetta. Supplements apply for lobster tail ($20) or larger cuts of beef ($59 for 36 ounces). The meal ends, as you would expect, with a variety of desserts including a house souffle. We found the temperature of our steak to be exact and had no complaints about the meal, but we did overhear more than one fellow patron complain about the dwindling size of the shrimp. Lunch here is excellent, and merely $10 per person. You get a choice of first course (including many of the same options from dinner, such as the crabcake and the carpaccio), followed by a main course with a choice of seafood, beef tenderloin, sandwiches, burgers, chicken or wild mushroom ravioli. Make sure to order dessert (perhaps the strawberry pavlova or the warm fudge brownie). Rudi's Sel de Mer (held in Pinnacle Grill, Deck 2); $49 per person: Rudi's Sel de Mer, a French seafood brasserie on Koningsdam that's described by some as a rapturous experience, is rather "meh" in its pop-up form on Oosterdam. We applaud the idea of featuring the menu of a specialty dining venue that isn't onboard in order to provide more choice, but the execution left us guessing why we paid $100 (more if you factor in the wine) for a dinner that was disjointed. We liked the upscale ambiance, with dark, romantic booths and tables featuring Rudi's signature "food face" plates. (Trust us, you'll know them when you see them.) We also liked that actual menus for Sel de Mer are brought in, adding an element of authenticity. There's a special beer and wine menu with featured cocktails, appetizers (such as a seafood tower and escargots), expensive-sounding entrees (including Maine lobster, Dover sole meuniere [de-boned tableside] and a catch of the day), rich side dishes (including truffle mashed potatoes and ratatouille) and dessert (featuring Rudi's souffle, which requires advanced notice). Fruits de mer platters designed for two can be ordered for an additional $25, which is high considering the cover charge. There were many efforts made to make the meal feel extravagant -- an amuse-bouche to start, presented along with a baguette, salted butter with chives and a plate of olives and roasted vegetables; French press coffee and an elaborate presentation of petits fours at the end of the meal; and a "thank you" note with truffles once you're back in your cabin. However, the meal itself is what we came for and that needed more oomph. The bouillabaisse, which seemed like a no-brainer at a French seafood restaurant, came in a plastic bag. OK, we know (because we were reassured many times) it is a food-grade plastic meant to keep the soup warm before it's broken open on the plate, but rather than add to the presentation, it felt sloppy -- not to mention the soup, even with the bag, wasn't hot. Other letdowns included a disappointing dessert course and a few inconsistencies in service. It's a special night out for two, to be sure, and the issues could be excused if the cover charge was lower -- after all, it's only a pop-up. Canaletto (Deck 9); $15 per person (dinner): Holland America's Canaletto is perhaps one of the most affordable alternative dinners at sea. For the price of an appetizer in a fine dining restaurant on land, a passenger can enjoy a full Italian meal. The menu starts with zuppa di pesce and buffalo mozzarella salad, and includes six different pastas and five entrees, such as veal, branzino and spaghetti made from zucchini. Canaletto even offers a specialty cocktail list with Italian aperitifs -- and dessert (which includes cannoli, gelato and tiramisu) doesn't disappoint either. Diners are encouraged to share pastas and other plates, which results in a respectable spread. We were impressed by the meal, the presentation and the super-attentive service, especially considering the price. The only catch is that Canaletto is not in its own dedicated space; it's a bit hidden, inside the Lido Market. This means that even though you dine in your own cordoned-off section, it still feels like you're eating at the buffet. Regardless, we overheard other patrons say they were just as impressed as we were and that they planned to make additional reservations during the cruise. Explorations Cafe (Deck 10); a la carte: This is the spot for a cup of tea or a coffee to go. Coffee drinks can be ordered hot or iced; bottled beverages (such as Vitaminwater) are also for sale. Items range from about $2 to $4. Room Service; a la carte: A handful of room service options carry an additional fee (except for passengers staying in Neptune or Pinnacle suites). For breakfast, a fresh fruit smoothie will run $4.95, while a smoked salmon Benedict costs $7.50 and steak and eggs will set you back $9.50. Burgers, hot dogs and fries from Dive-In are available in your cabin for a $4.95-per-item fee. Steak from Pinnacle Grill costs $15 per order to be sent to your room; lobster is $20.